Finishing up the latest trip to the UK our final destination was a date with U Hkun Sa, Secretary of Constitutional Affairs Department of ENC and General Secretary of the Kachin National Council of the Kachin National Organization (KNO). In 1988, Hkun Sa, a prominent lawyer, was actively involved in the Bar association in Mytkyina. He was one of the founder members of the Kachin State National Congress for Democracy KNCD, which had a very close working relationship with the NLD. He was elected as General Secretary and in the 1990 election the KNCD won 3 seats. In the aftermath of the election when the regime refused to hand over power, village leaders (under control of KIA/KIO) were interrogated by Military Intelligence (MI) about Hkun Sa. He was accused of having gone to their areas and meeting with KIA/KIO leaders. He was summoned and questioned by MI and answered in a written statement. He was asked about the 1962 coup by Ne Win and his answer was that it was against the 1947 constitution and was a misuse of the peoples’ trust in the Government and army. Again he was asked the same question about SLORC coup in 1988 and he replied that there was no provision in the 1974 constitution to allow for a military coup and thus, he was charged under section 5J and taken to Northern Common Division military court no 34 where he repeated his answers in cross questioning the prosecution. He was sentenced to 10 years with hard labour in prison and was transferred to Mandalay prison. In prison he was appointed the leader in Mandalay prison of a programme of supporting the political prisoners set up by Aung San Suu Kyi, who was providing medicines, food, healthcare etc to political prisoners in prison. Upon release from prison his lawyer’s licence was revoked and he couldn’t practice law. He stayed at his cousin’s house in Hpa Kant but MI came after him, hassling his family and friends, monitoring his every move and demanding his every movement and travel is reported to the MI. His wife’s motorcycle rental business was shut down by the authorities as they took away his licence. Even his daughter was affected by the constant pressure from the regime – she had been elected on a youth exchange programme to Japan but the regime did not allow her to go. Whilst Hkun Sa had been in prison, Duwa Bawmwang `La Raw, the president of the Kachin National Council of KNO in exile had heard about him and had constantly sent words of encouragement and when Hkun Sa was released from prison he asked him if he was interested in politics he would arrange to take Hkun Sa to exile in Thailand. Two years later it was arranged and Hkun Sa left for Thailand on 5th February 2002 arriving on 17th Feb. He joined the Ethnic Nationalities Council (ENC) and was elected Chairman of the Kachin State Constitutional drafting committee (a role he still has today) and was handed the responsibility for drafting the constitution for a Kachin State within a Federal Burma. As he had also been the General Secretary of the KNCD inside Burma at the time of the 1990 election he was now also asked to form the KNCD-LA under the umbrella organization United Nationalities League for Democracy-Liberated Areas (UNLD-LA). He carried out these duties and in February 2003 was elected Vice Chairman of the UNLD-LA. In May 2003 along with 10 high ranking exiled leaders he travelled to Northern Ireland for a training programme in the peace building process. He claimed asylum in the UK and it was granted in September 2003. He continues to work tirelessly for democracy and freedom in Burma in his current role as Secretary of Constitutional Affairs Department of ENC and General Secretary of the Kachin National Council of the Kachin National Organization (KNO). Sometimes you can only move forward by going back to the beginning – and one year on that’s exactly what I’m doing in preparation for taking this campaign to the next level. With exciting developments on the horizon, where better than to gather your creative thoughts and ideas than with one of Burma’s most famous exports – world renowned artist Htein Lin. You can read all about Htein Lin here on this blog when I first took his portrait almost exactly a year ago to the day. ‘Back in the USSR’ as the song goes… (well ok, the UK really) and a chance meeting lead to another former political prisoner joining the campaign. Monday March 8th was International Women’s Day – a global day celebrating the economic, political and social achievements of women past, present and future. No such celebrations in Burma where there are currently 177 women political prisoners, from various sectors of society, who are imprisoned for their political beliefs. There are women in prison as young as 21 and as old as 68. Many women have been separated from their husbands and children. Full details on Women political prisoners in Burma is available on the AAPP website. 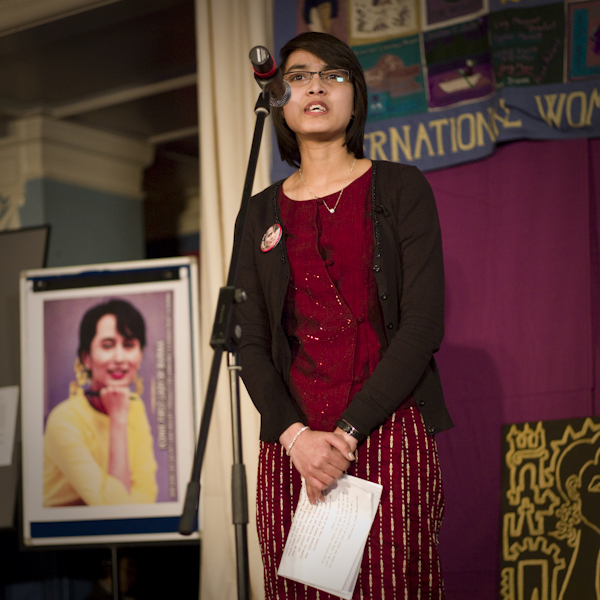 In Oxford, UK, International Women’s Day was celebrated with an event dedicated to Daw Aung San Suu Kyi – “Breaking the Glass Ceiling in Burma”. It was at this event that I had planned to photograph another former political prisoner who was helping to organize it and to do so in Oxford with all it’s connections to Daw Suu made it very poignant. In fact we had first tried to meet up with Kaung Myat Thu when we were in Norway as he was living in Oslo but were never able to track him down. So it was great to have finally met – in fact our first meeting came about completely by chance when a group of us met up and it wasn’t until someone called him by his name that I asked if he was in fact Kaung Myat Thu, former political prisoner who lived in Oslo! he was and here we are now in Oxford taking his portrait to add to the other 116. “Whoever is a member of an unlawful association, or contributes or receives or solicits any contribution for the purpose of any such association or in any way assists the operations of any such association, shall be punished with imprisonment for a term (which shall not be less than two years and more than three years and shall also be liable to fine). He was detained in Insein prison form 1989 to 1991 where he was then transferred to Tharawaddy prison. He was released on 23rd December 1992. 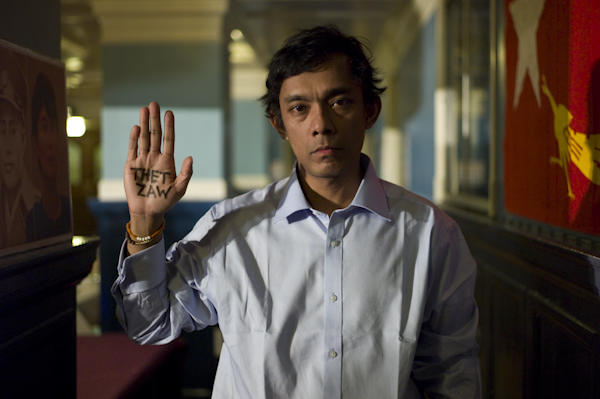 He remained in Burma for the next 10 years, still working secretly in his organisation before finally fleeing to the Thai border in 2003. He spent two years in Mae Sot and Nu Po camp before being resettled in Norway. Where he lives now… just not when I went there looking for him! The event in Oxford was a huge success with the main highlights being some superb traditional dancing from Miss J.San – the Secretary General herself – and a rousing speech from Mya Aye’s daughter Waihnin Pwint Thon, both worthy of the ovations they both received. Both reminding us on this day of celebration of women of the very different lives that women face inside Burma.